Contains milk, wheat and soy ingredients. Processed in a facility that also processes egg and peanut ingredients. Ultra Premium Why Protein Blend (whey protein concentrate, whey protein isolate), Maltodextrin, Advanced Recovery and Performance Blend (Creatine Monohydrate, Taurine, L-Lysine HCL, L-Isoleucine, L-Valine, L-Glutamine), Glycine, Natural and Artificial Flavors, Chocolate Cookie Crumbs (Rice Flour, Sugar, Tapioca Starch, Alkalized Cocoa, Palm Oil, Corn Starch, Salt, Natural Flavors, Sodium Bicarbonate, Soy Lecithin) Salt, Soy Lecithin, Protein Digestive Enzyme Blend (papain, amylase), gum blend (cellulose gum, xanthan gum, carrageenan), sucralose, acesulfame-potassium. Mix 1 to 2 servings (1 to 2 scoops) with 4 to 8 oz. of cold water or skim milk according to taste in a glass or shaker cup. Use between major meals and before and after exercise. Read the entire label before use and follow the directions provided. Consume 10 glasses of water daily for good health. 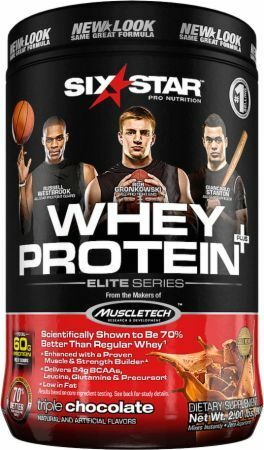 Ultra Premium Why Protein Blend (whey protein concentrate, whey protein isolate), Maltodextrin, Advanced Recovery and Performance Blend (Creatine Monohydrate, Taurine, L-Lysine HCL, L-Isoleucine, L-Valine, L-Glutamine), Glycine, Cocoa Powder, Natural and Artificial Flavors, Soy Lecithin, Protein Digestive Enzyme Blend (papain, amylase), gum blend (cellulose gum, xanthan gum, carrageenan), sucralose, acesulfame-potassium FD&C Red No. 40 Lake. Ultra Premium Why Protein Blend (whey protein concentrate, whey protein isolate), Maltodextrin, Advanced Recovery and Performance Blend (Creatine Monohydrate, Taurine, L-Lysine HCL, L-Isoleucine, L-Valine, L-Glutamine), Glycine, Cocoa Powder, Natural and Artificial Flavors, Soy Lecithin, Protein Digestive Enzyme Blend (papain, amylase), gum blend (cellulose gum, xanthan gum, carrageenan), sucralose, acesulfame-potassium. Ultra Premium Why Protein Blend (whey protein concentrate, whey protein isolate), Maltodextrin, Advanced Recovery and Performance Blend (Creatine Monohydrate, Taurine, L-Lysine HCL, L-Isoleucine, L-Valine, L-Glutamine), Glycine, Natural and Artificial Flavors, Soy Lecithin, Protein Digestive Enzyme Blend (papain, amylase), gum blend (cellulose gum, xanthan gum, carrageenan), sucralose, acesulfame-potassium.